Hearts provides professional pest control services to San Diego, Orange, Los Angeles, Riverside and San Bernardino Counties. Whether you have ants, spiders, rodents, bees, gophers, or bed bugs you can expect licensed, top-notch, certified and customized service. Great service. The technician actually listens. Very hppy. As a parent, the most fundamental responsibility is to provide a safe and happy home. So one can imagine the sense of failure when we returned home from a trip to find an epic ant invasion of our property and home. We keep a vegan, cruelty-free, eco-friendly, organic household so Hearts was the only company who we would trust to help us. One call to Ellen and we were assured that Brandon would be at the house the next day. Brandon arrived exactly on-time and was fantastic. We discussed the situation and our proirities and Brandon treated the house immediately. Within hours the ants were gone both inside and outside. Not a single ant has visited us inside since the treatment and the trails of ants in the yard and pool area are gone. Thank you to Ellen, Brandon, and the Hearts team for helping us enjoy our home after the invasion! Brandon did a great job for the initial visit. Great overall service and friendly staff. All the bugs gone. Thanks Hearts Pest Management! Brandon comes for our monthly service, and he is very pleasant and easy to talk to! I learn something new every time re: pests! Hearst is lucky to have him! Thanks Brandon!!!!!!! Great job! We are always very happy with the service. Brandon is always providing us with the best customer service, very thorough and gopher free for so many months now that I can't even remember when was the last time there were any signs of them. I have used Hearts for the last 3 years and have found them to be very professional and have taken care of all my pest issues. Fast, honest, effective, good price. I'm happy and would use Hearts again. Great product and great service. 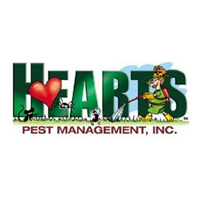 We love that Hearts offers organic pest management. Can't recommend them highly enough. The company has been very easy to deal with and very caring about making sure our pets and child are safe. We had a huge ant problem when we called them, and they have eliminated it! He came to check the traps, checked them and left! He never told me if they were empty or if we had rats. All the mother technicians that have come out will check them and let me know that situation. Please call and let me know what he found. We have been using Heart's Pest Management for one year. Hearts has been servicing my property for the past few years after a rash of gopher activity tore up my back yard. Thanks to their work and continued treatment the gopher activity has been minimized. after 1 service I called and asked to make sure the technician locks my back gate and he did so this time so thank you. I also asked that they clean up spider webs around the house--they also did this a bit better on the main house-- but there were still massive webs around my garage and laundry room doors. My Garage is a detached building that has 2 doors--one for the garage and one for the laundry room---I park in the garage and exit the door and cross my patio to enter my home in the rear--and when I walk thru my garage door I always walk into a massive spider web. you can see large webs under the eaves as well plain as day-- when i do laundry its the same thing--I would assume if there is a door on a building they would automatically get the spider brush out and make sure there aren't webs surrounding any doors because a door means someone would enter to exit thru it---its kinda ridiculous i have to call again to tell them this don't u think??? I love the fact that I can count on the squirrels being gone after a treatment, as well as the earwicks. But if not performed on a regular basis they are back. Love me some Hearts Pest Management. I've had a few issues, all different and all at different times, and the staff at Hearts always helped me resolve it. Even when I thought I had tried everything to get rid of an ant problem one time, and a rodent problem another time, the guys at Hearts were able to resolve the issues with a level of expertise and knowledge that you can't really understand until you see them at work. Have been using Hearts for roughly two years. Pleased with each interaction and with the results of their service. They seem knowledgeable and make efforts to provide good service. We have used Hearts PM, for the last 3-4 years. We started with them in San Diego and then continued their service once we moved to the Los Angeles area. Currently doing basic monthly general pest service. Great Technicians, great Customer Service!! !